Whilst we do not currently have an online facility to purchase vouchers, the process is relatively straight forward. Simply call us on 020 8656 9222 and ask to purchase a gift voucher. Our sales adviser will require your full name and mailing address, a contact telephone number, along with your 16 digit credit card number. You will then be asked the type of voucher required and we’ll confirm the payment amount. The payment is processed there and then whilst you are on the telephone. You are then asked to provide your personal gift message for the gift letter. 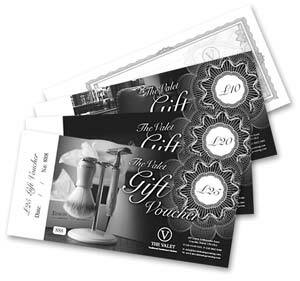 We offer our store vouchers in denominations of £10.00, £20.00 & £25.00 which can be redeemed against all in store products and treatments. See our full range of treatments here. 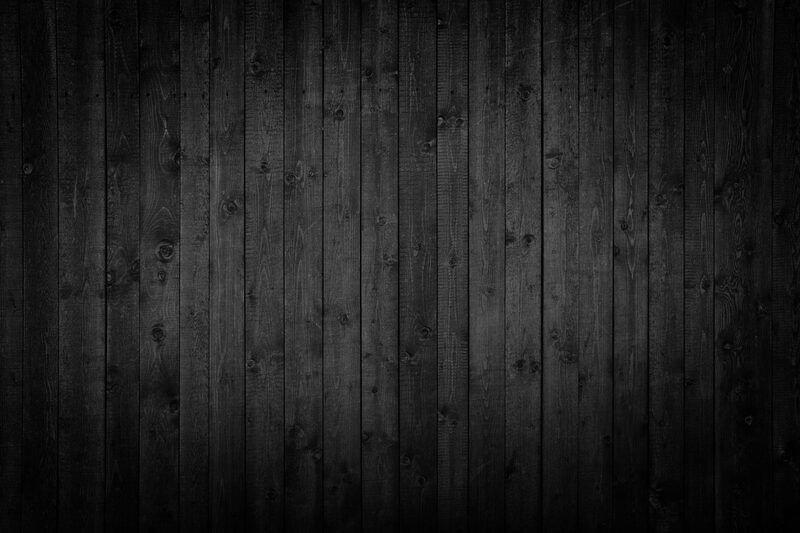 The gift letter & voucher is placed in a black Valet envelope and sealed shut. This envelope is then placed into a further mailing envelope along with our store menu and your card transaction & purchase receipt, which is then mailed to the address provided, so that when this is received your end, you can simply hand the black Valet envelope and menu to the person you are gifting. Vouchers ordered before 3 pm will be posted the same day by Royal mail 1st class post. Orders taken after this time will be posted out the next working day before 5 pm. If you prefer we can mail the same directly to the recipients address on request. Alternatively, treat your loved one or friend to one of our Signature treatment packages and give them a true flavour of what the Valet is all about. A memorable, traditional Barber shop experience by means of a voucher. Valet Signature treatments include a wash, cut and style and our classic hot towel shave – a unique formula of lemon scented sauna-baked hot towels, hot lathers of pre and post-shave Proraso shaving creams and a quality balm and cologne to round off the treatment. Deluxe versions carry two additional hot towels and includes two applications of Geranium gel massaged into the face for a real soothing cleanse after the shave. 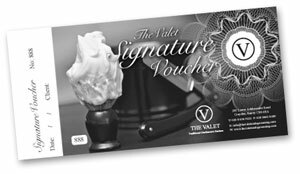 Signature Vouchers start at £45.00. The Californian Hot Towel is available at £48.50 and includes a complementary Chivas Regal. For the ultimate treat, indulge them in our Californian Signature. This includes an Esquire wash cut and style, our classic hot towel shave, followed by a full deep facial cleanse – incorporating plenty of steam, a cleanser, a walnut & almond scrub, a light clay mask, a herbal toner and an oil free moisturiser (All by Baxter of California) The process carries a total of five hot towels and plenty of steam to the face and to finish off with style – a splash of wood & spice cologne. Go on – give him the Californian treatment he deserves and gift him a treatment voucher – Call our sales line on 020 8656 9222 to order your male grooming gift voucher now. Call before 3 pm to place your order for a next day delivery.